This is the second article in a two-part series exploring organizational identity. 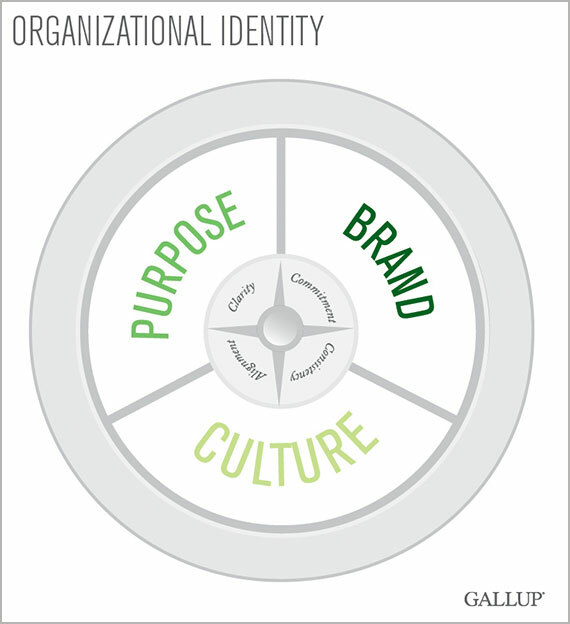 Organizations often make claims about their purpose and identity, but behave quite differently in reality. This misalignment is costly; Gallup research at a client company indicates employees who are more aligned with their organization's identity perform higher on key business performance metrics than do employees who are less aligned. Customers, too, can tell the difference between companies that deliver on their brand promise and those that just pay lip service to it -- and they react accordingly. When customers are aligned with a brand promise, they give that brand twice as much share of wallet (47%) as customers who aren't aligned with that same brand (23%). Gallup's research has identified five drivers that enable organizations to close the gap between their actual and aspirational identity. By addressing the following five questions, company leaders can encourage employees to make the organization's desired purpose, brand and culture a reality. How do the company's leaders communicate and act? The way a company's leaders define, display and communicate an organization's purpose and brand influences whether employees will embody those values, especially with customers. Actions always speak louder than words, so the most influential messages are conveyed by how leaders act. For example, many leaders tell their employees they want their company to be innovative and offer cutting-edge products and services to their customers. But when Gallup conducted focus groups with one such company, top managers said they were reluctant to take the risks required to be innovative because the company didn't reward risk-taking; instead, managers feared that failure would be fatal to their career. A typical response was, "I'd rather stay just under the radar and do the same things as last year, because that almost ensures I'll be here in five years. But if I take a risk, I might not be here next year." Promoting this kind of mixed message stifles the innovation company leaders seek. Another type of mixed message happens in company call centers. Company leaders often tell their call center employees, "Customers come first -- so take the time you need to ensure you're solving customers' problems." This sounds good in theory, but in practice, most call center employees are rated based on their "handle time," or the average number of calls they complete in an hour. If employees don't meet a standard rate, they're frowned upon, regardless of how many customers' problems they solved. But some organizations get this right: A major insurance company, for example, celebrated a call center employee who stayed on the line with a customer for more than an hour because that customer was going through a difficult time and needed someone to talk to. The call center rep was recognized for providing exemplary service and for demonstrating the company's commitment to its customers -- and exhibiting behavior consistent with the organization's purpose. Do the company's values and rituals support its identity? Values should be explained and modeled in a way that reinforces the organization's identity. Common and important social interactions offer a way to communicate an organization's desired identity and create occasions that strengthen it. Who are the company's employees? To create a culture that delivers on the company's purpose, businesses must select, engage and develop employees in ways that introduce and reinforce the organization's values. Too many companies establish and deliver their selection, engagement and development programs in silos. This approach doesn't deliver business results, and it doesn't support an organization's desired identity. A new employee might be attracted to a company because of its promised focus on strengths, but in his performance review, all his manager talks about are his weaknesses and how he's missing goals. Not only is this experience disengaging, it's also disingenuous: The company promised its employees one employee experience, but delivered something else entirely. Does the organizational structure deliver on its desired identity? An organization's processes and structure affect how customers and employees perceive the company and color their experiences with it. For example, if a brand promises a relentless focus on customer service, but customers who need support are constantly shuttled from rep to rep or team to team, companies can't expect customers to feel like they've received the highest level of personal service. And if a business goal is to produce a stream of innovative products, the company's engineering, design, communication, marketing and customer service teams must be structured to encourage frequent interaction -- which, in turn, can promote a steady stream of new, commercially viable ideas. Aligning an organization's structure with its identity is key to achieving its highest potential. How does the organization measure and reward performance? Aligning a company's measurement and performance systems with its identity is also crucial to maximizing business performance. Everything from goal setting to accountability -- and especially pay and recognition -- must encourage employees' efforts to fulfill the company's purpose, deliver on its brand promise and create a culture that promotes success. Misaligned measurements and incentives create confusion and inconsistency for employees -- and that translates into confusion and inconsistent experiences for customers. As a company develops and grows, it may create programs that directly answer one or more of these questions. Too often, though, departments or teams -- such as the marketing group that creates a new brand campaign or the HR team that launches a new onboarding program -- implement initiatives without considering whether they align with the organization's identity. This results in limited outcomes that don't move the company forward. To correct this patchwork approach, leaders must step back to objectively review their organizational identity and determine whether their programs and processes align with it. This step can help bridge the gap between the organization's current identity and the aspirational identity that will inspire employees and attract and retain customers.